Tonight Jenny, Sally, Derek, Jake, Crissy, Mom, Jeff, Sarah and I rode the Hocking Valley Scenic Railway in Nelsonville for their New Year's Eve celebration. First we visited at Jenny's house and had a quick bite to eat. We all met up at the train depot around 9:30pm. We were all boarded and seated before 10:00. The train departed promptly at 10:30. Once we were underway the crew past out the pizza, pop and party favors. Most of the kids on the train were given horns. The noise was unbearable for some people (like mom). I couldn't help but laugh. We rode 10 miles to Logan and then began our trip back towards Nelsonville. The train stopped in Haydenville where we all climbed off of the train to watch the fireworks display. The fireworks were not the largest display in the world but were very nice. The show lasted about eight minutes. After the pyrotechnics we again boarded the train and headed back to the Nelsonville depot. 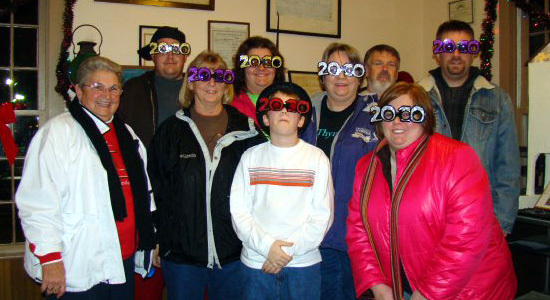 We all had a great time bringing in 2010. Sally, Derek, Jenny, Sarah, Jake, Mom, Jeff, Crissy and Me.